baked aloo ka samosa is a healthy version of samosas which are baked and made with whole wheat flour and has a spiced stuffing of potatoes and green peas. baked samosa recipe with step by step photos – a healthy version of aloo samosa which are baked and made with whole wheat flour. i sometimes make these baked samosa when we want to have a healthy recipe of samosa with ginger tea. this aloo samosa recipe, i have learnt in my home science college days and i still follow it. it gives me good results always. 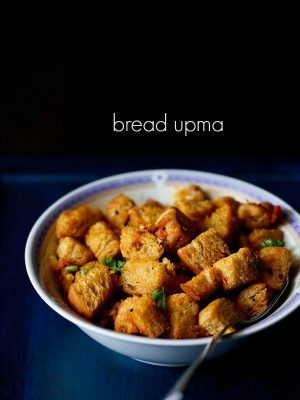 generally most indian snacks like kachori, pakoda, chips when baked do not taste like their fried counterparts. of course goes without saying the fried ones are always tasty. 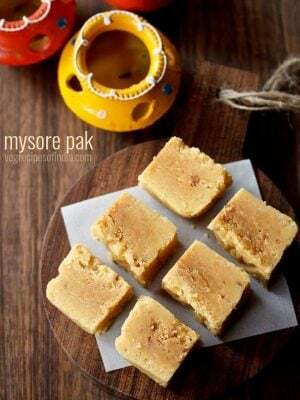 but at times you want something light for the heart as well as for the stomach, especially with the most loved indian snacks. for now i only prepare samosas and papdis in the oven. i did not like the texture of pakoras made in the oven. 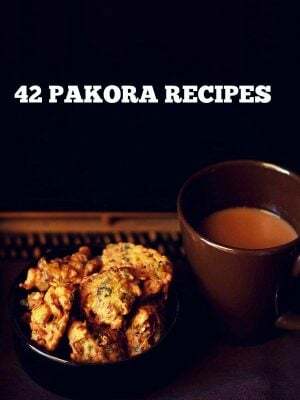 may be when i develop a good recipe of pakoras that can be made in the oven, i will definitely add the recipe. 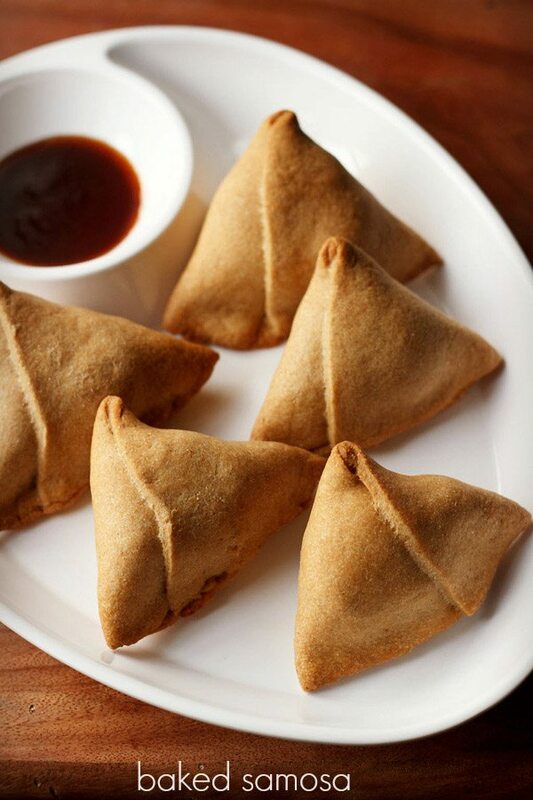 the texture of these baked samosas are not like the fried ones. they are crisp, flaky but you won’t get the texture that happens when samosas are fried. i even tried a batch of these in the air fryer. honestly speaking the air fried ones were better as far as texture was concerned than the oven baked ones. they tasted similar to the fried samosas, minus the oil. if you are looking for recipes that can be made in an air fryer, then just comment below on which air fryer recipe you would like to see on the website. as mentioned above, i have used whole wheat flour in the samosa pastry. 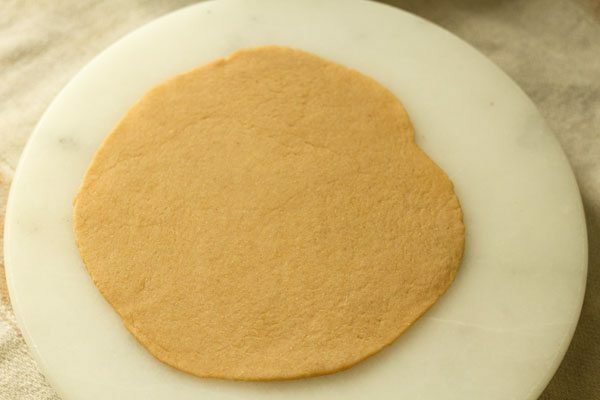 of course you can use all purpose flour (maida or refined flour or white flour) or a half-half of both whole wheat flour and all purpose flour. 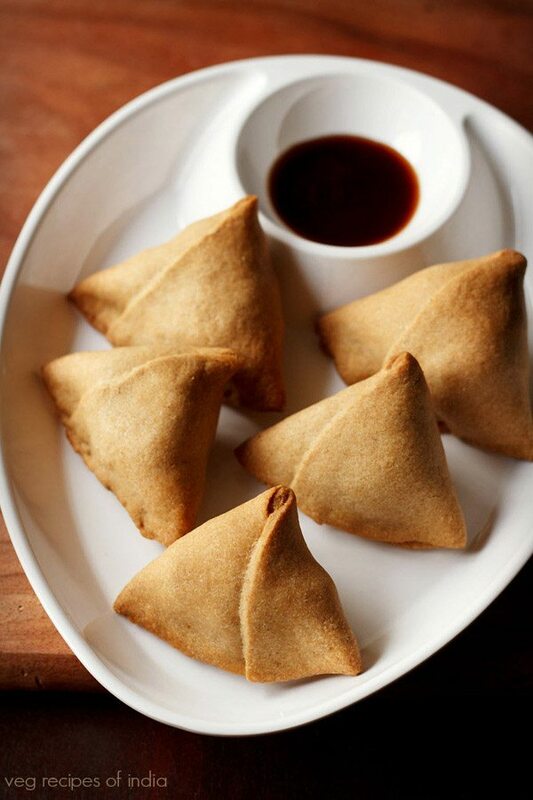 if you have an air fryer, then you can make these potato samosa in the air fryer or else bake them in the oven. and if you want, you can even fry them. do check this detailed samosa recipe, to know more about the frying tips. you can also check this bengali version of samosa called as singara. enough fat or moyen should be added to the flour. one of my friend had suggested 1/5th of fat to 1 part of flour in weight. 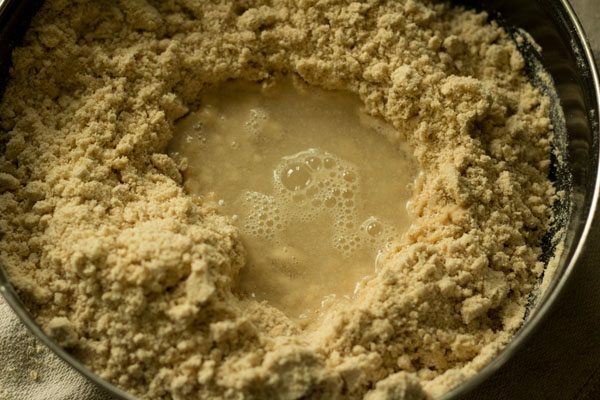 the amount of water added depends on the quality and texture of the flour used. 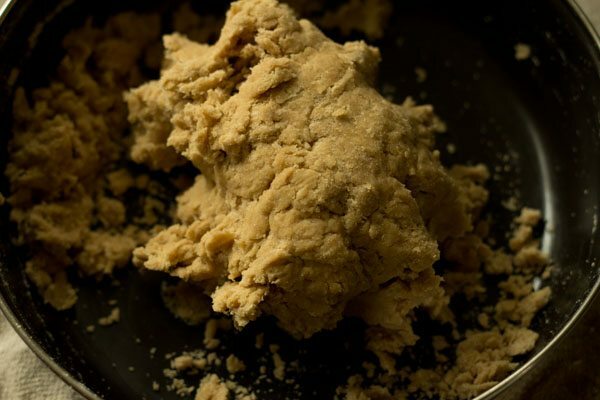 so remember to knead into a tight firm dough and add water in turns when kneading. don’t roll the samosa crust too thick otherwise it will take too much time to bake it and it can become hard due to a prolonged baking. 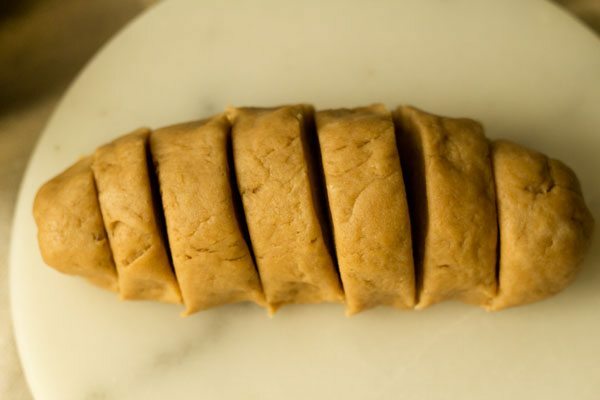 also don’t roll the samosa too thin, as it won’t able to contain the potato stuffing. do brush with some oil before you bake the samosas. a pinch of baking soda does help in making the samosa crust a bit soft. serve these aloo samosa hot or warm with tamarind chutney or pudina chutney or even tomato ketchup. seive 2 cups whole wheat flour and 1 teaspoon rock salt in a mixing bowl. if there is too much of bran in the flour, then sift thrice. you can add salt as per your taste. now add 5 tablespoon oil. the whole mixture should clamp together when joined. if not then continue to rub the oil or ghee in the flour. then add 1/3 cup water. begin to knead adding more water if required. depending on the quality of flour, you may need to add less or more water. if using all purpose flour, then less water will be required. for all purpose flour, just add 4 to 5 tablespoons first and then add more water if required. knead to a firm dough. cover the dough with a moistened napkin or kitchen towel and keep aside for 30-40 mins. 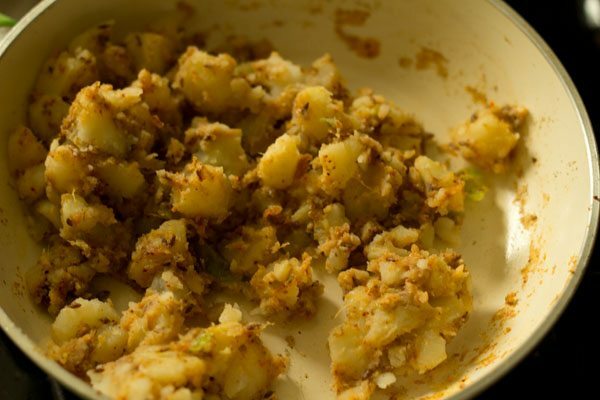 steam or boil 250 grams potatoes (about 3 medium to large potatoes) till they are thoroughly cooked. when the potatoes are warm or cool down, then peel and chop them in small cubes. 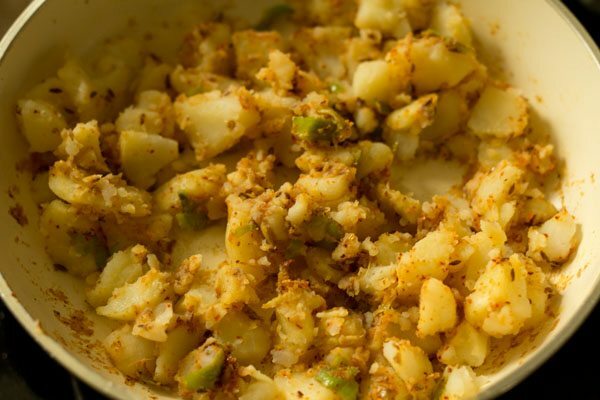 you can also add 1/3 cup matar/green peas to the filling. 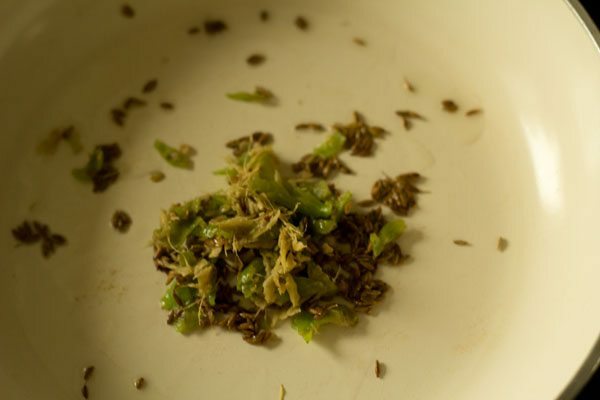 crush 2 green chillies + 1/2 inch ginger coarsely in a mortar-pestle. heat 2 teaspoon oil in small frying pan. add 1/2 teaspoon cumin seeds and saute till they splutter. then add the crushed green chili and ginger paste. mix well. then add 1/2 teaspoon red chilli powder and 1/2 teaspoons coriander powder. mix again. now add the potato cubes. 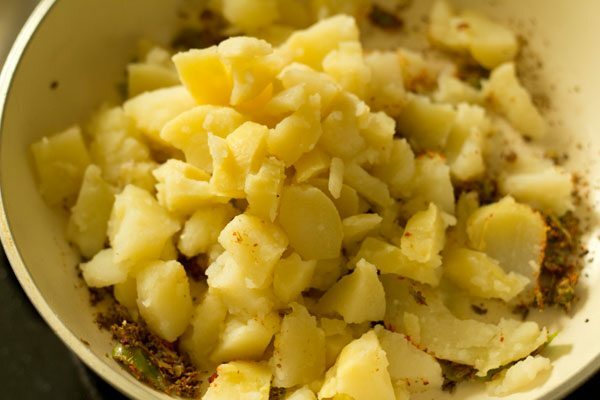 mix the spices very well with the potatoes. now add 1/4 teaspoon garam masala powder, 1/2 teaspoon dry mango powder and salt as per taste. mix everything again very well. switch off the flame. lastly add 2 tablespoons chopped coriander leaves. mix the coriander leaves with the aloo stuffing and keep aside. after 30 minutes, knead the dough lightly again. 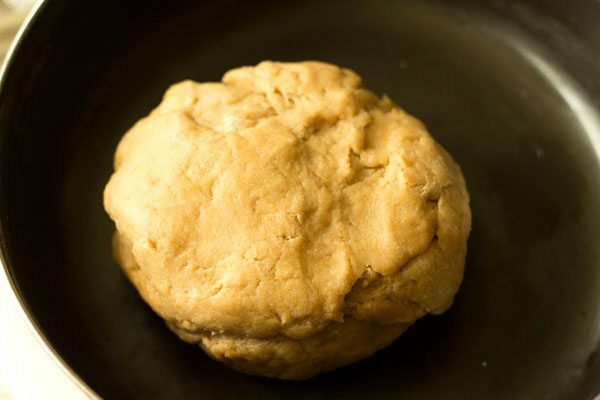 divide the dough into 7 or 8 equal pieces. take a dough piece. 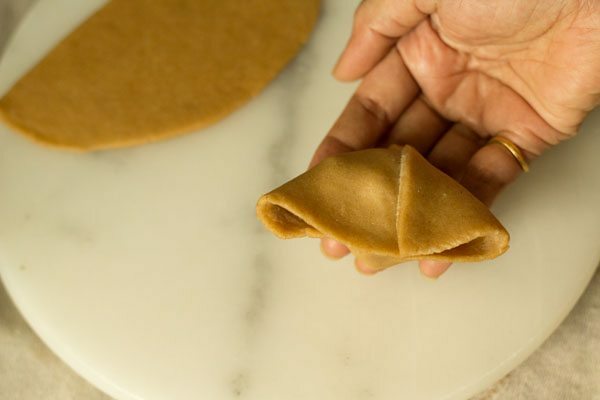 roll it on your palms and place it on a rolling board. 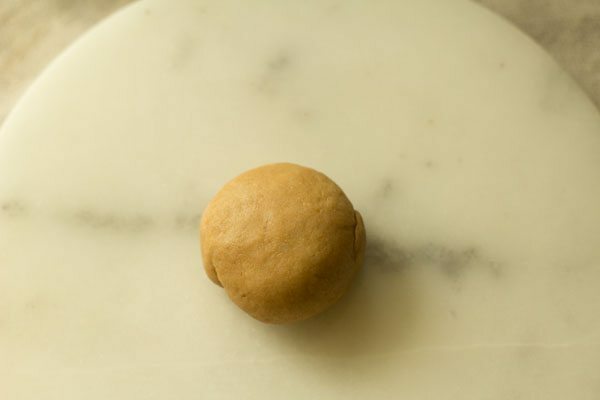 with a rolling pin, roll to a round or circle, keeping the thickness neither thin nor thick. with a brush or with your finger tips, on the straight edge of the sliced dough, apply some water. join the straight edge, overlapping the two edges a bit. press the edges well, so that they get sealed. it will look like a cone. now with a small spoon, stuff the potato filling in the cone. 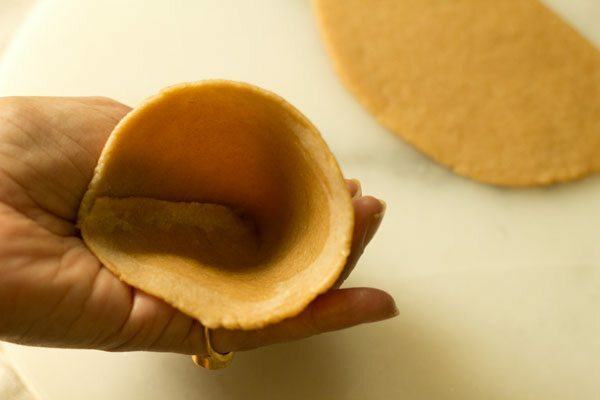 pinch a part of the samosa cover and seal the base edges. this helps the samosas to stand. be sure there are no cracks. the edges should be joined very well. prepare all samosas this way. 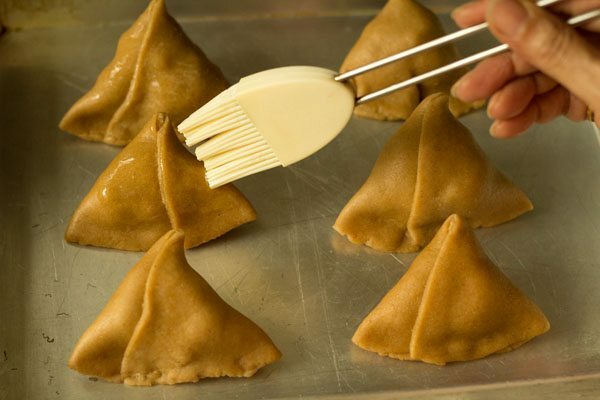 as you go on making them, cover them with a kitchen towel so that the outer pastry does not dry out. before baking, preheat oven at 180 degrees celsius for at least 15 minutes. now keep them in a baking tray. brush the samosa with some oil. bake the aloo samosa in a preheated oven at 180 degrees celsius for 30 to 35 minutes, till the crust is golden and crisp. i baked for 34 minutes. oven temperatures vary so do keep a check. allow them to cool down a bit for a couple of minutes as the aloo samosas will be very hot. 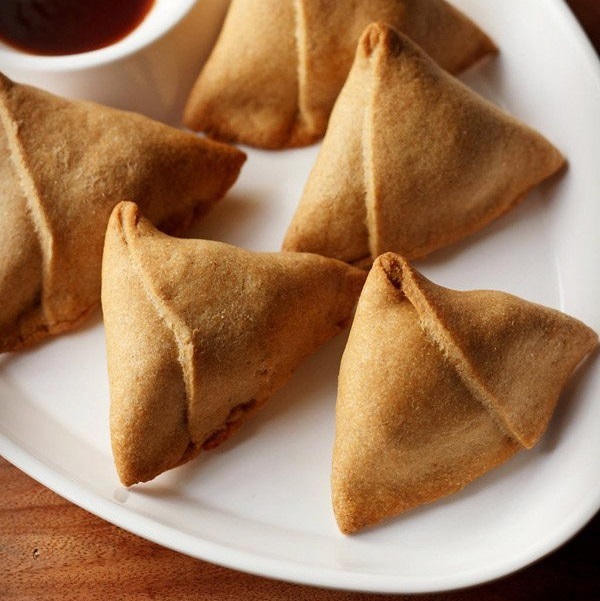 when they are hot enough to eat, then serve these baked samosas with your favorite chutney. 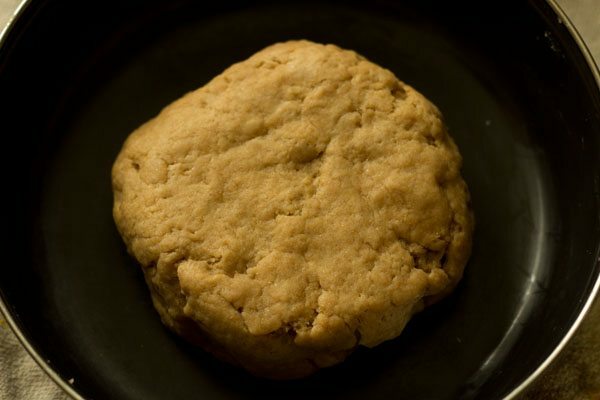 1. seive 2 cups whole wheat flour and 1 teaspoon rock salt in a mixing bowl. 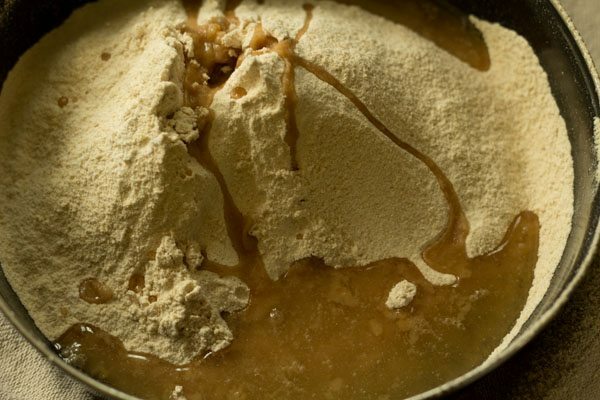 if there is too much of bran in the flour, then sift thrice. you can add salt as per your taste. 2. now add 5 tablespoon oil or ghee. 3. with your fingertips rub the ghee/oil in the flour to get a breadcrumb like consistency. 4. the whole mixture should clamp together when joined. if not then continue to rub the oil or ghee in the flour. 5. then add ⅓ cup water. 6. begin to knead, adding more water if required. depending on the quality of flour, you may need to add less or more water. if using all purpose flour, then less water will be required. for all purpose flour, just add 4 to 5 tablespoons water first and then add more water if required. 7. knead to a firm dough. cover the dough with a moistened napkin or kitchen towel and keep aside for 30 to 40 mins. 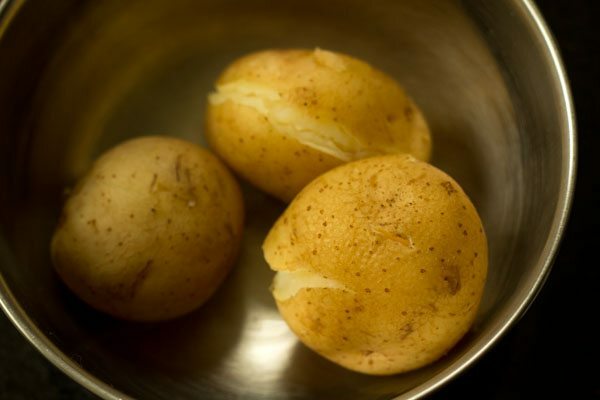 1. steam or boil 250 grams potatoes (about 3 medium to large potatoes) till they are thoroughly cooked. when the potatoes are warm or cool down, then peel and chop them in small cubes. you can also add ⅓ cup green peas/matar to the filling. 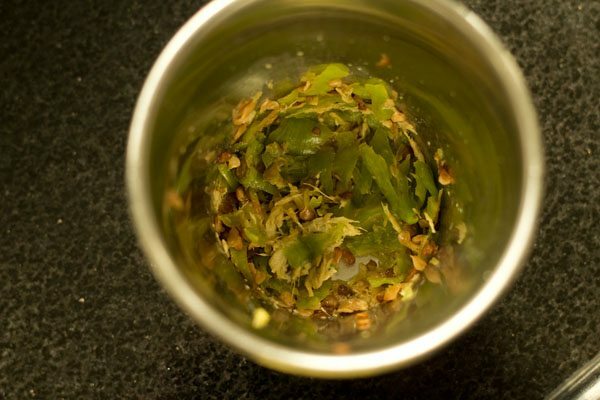 2. crush 2 green chillies + ½ inch ginger coarsely in a mortar-pestle. 3. heat 2 teaspoon oil in small frying pan. 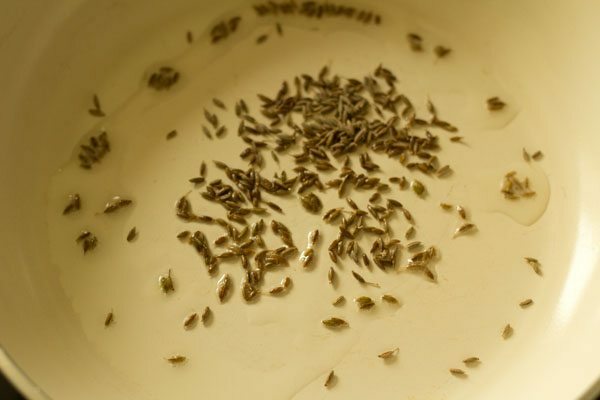 add ½ teaspoon cumin seeds and saute till they splutter. 4. then add the crushed green chili and ginger paste. mix well. 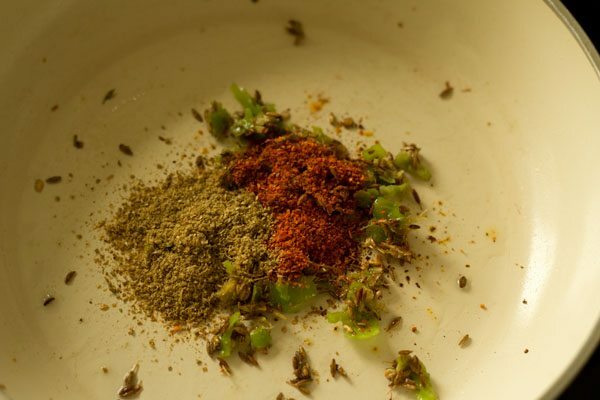 5. then add ½ teaspoon red chilli powder and ½ teaspoons coriander powder. mix again. 6. now add the potato cubes. 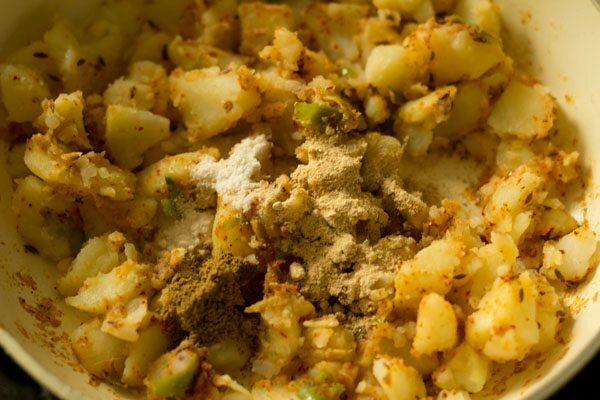 7. mix the spices very well with the potatoes. 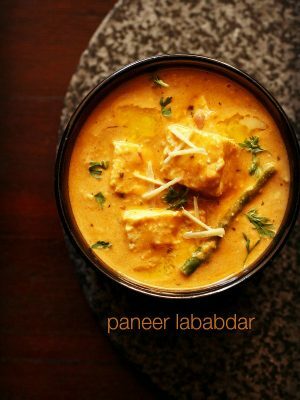 8. now add ¼ teaspoon garam masala powder, ½ teaspoon dry mango powder and salt as per taste. 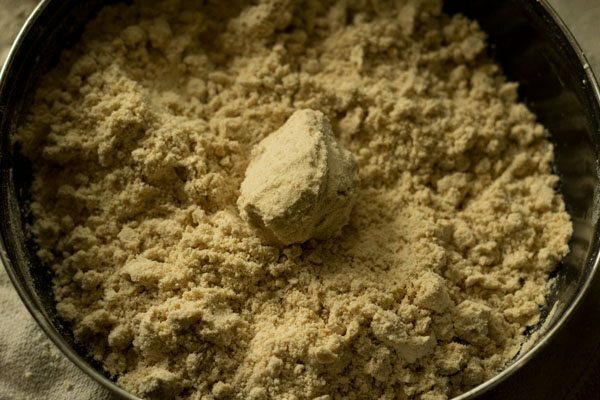 if you do not have dry mango powder, then add a few drops of lime or lemon juice. 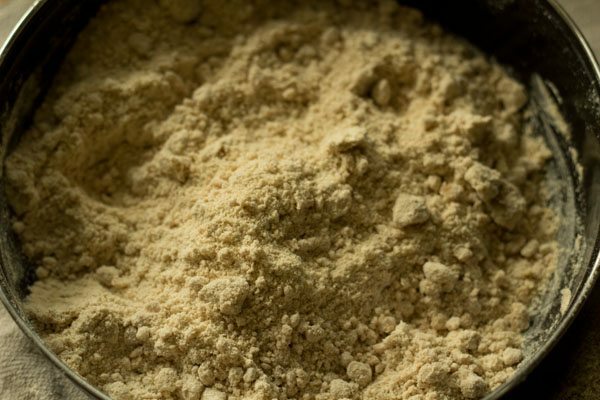 you can also add dry pomegranate powder instead of dry mango powder. 9. mix everything again very well. switch off the flame. 10. lastly add 2 tablespoons chopped coriander leaves. 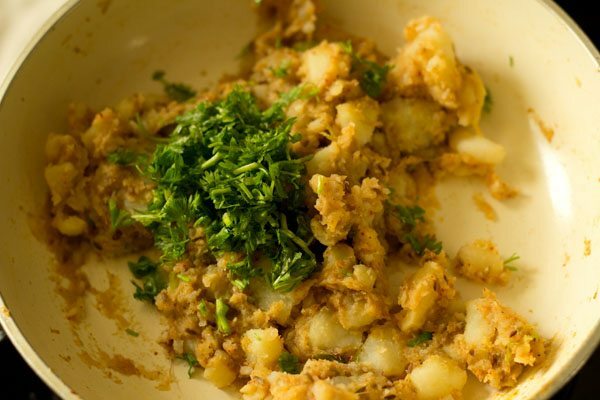 mix the coriander leaves with the aloo stuffing and keep aside. 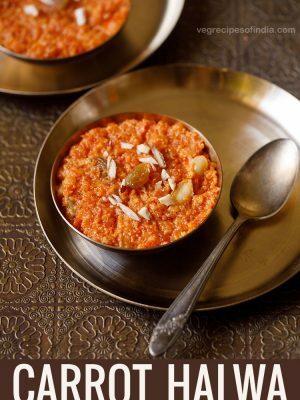 check the taste and add more of the red chili powder, garam masala powder and dry mango powder if required. 1. after 30 minutes, knead the dough lightly again. 2. make a log. 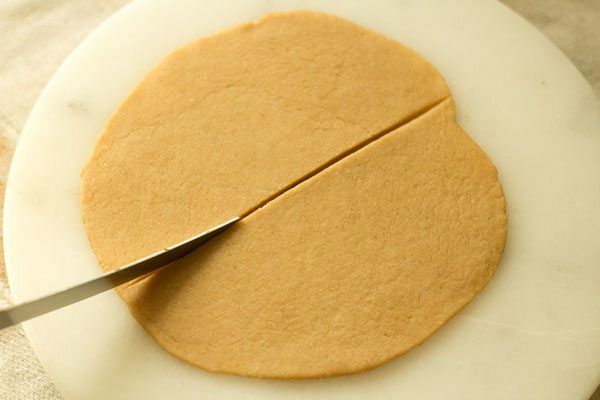 slice and divide the dough into 7 or 8 equal pieces. 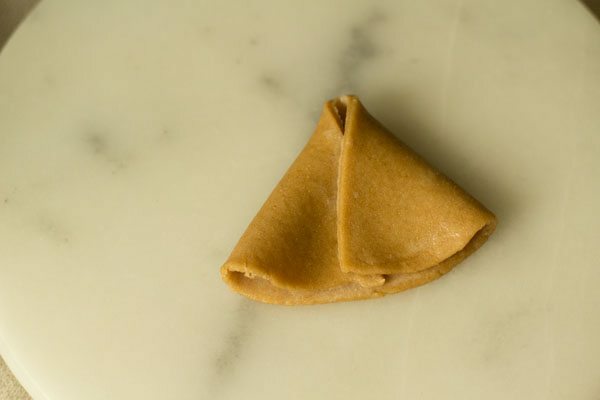 3. take a dough piece. 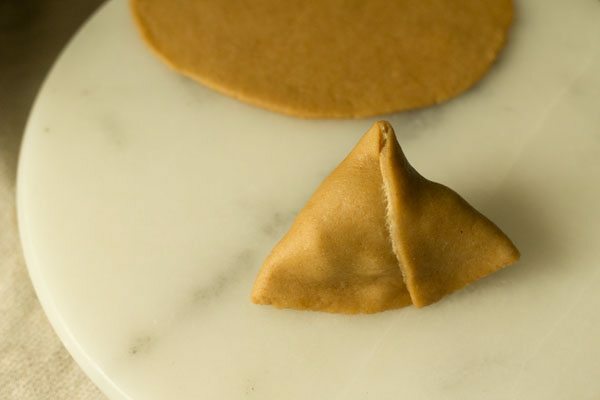 roll it on your palms and place it on a rolling board. 4. with a rolling pin, roll to a round or circle, keeping the thickness neither thin nor thick. 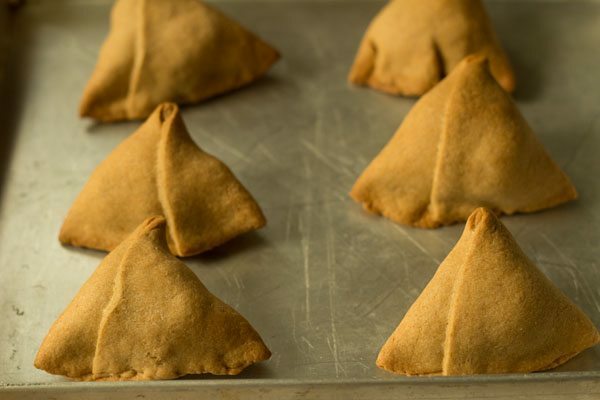 5. cut with a knife or a pastry cutter through the center of the samosa pastry. 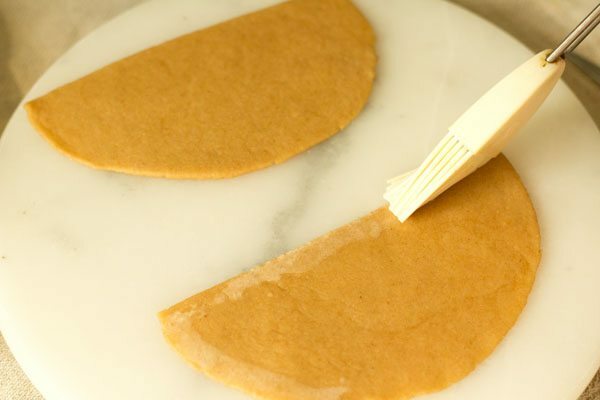 6. with a brush or with your finger tips, on the straight edge of the sliced dough, apply some water. 7. bring together the straight edge with one of its end overlapping a bit the other end. press and seal the edges. 8. press the edges well, so that they get sealed. it will look like a cone. 9. now with a small spoon, stuff the potato filling in the cone. pinch a part in the edge as shown in pic below. this helps the samosas to stand when placed on a tray. 10. press both the edges. be sure there are no cracks. the edges should be joined very well. 11. so one samosa is ready. 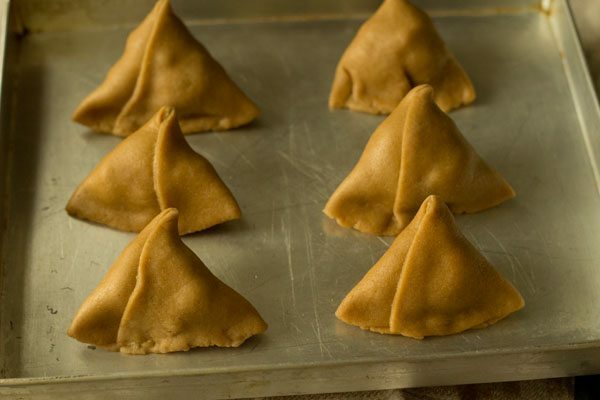 12. prepare all samosas this way. 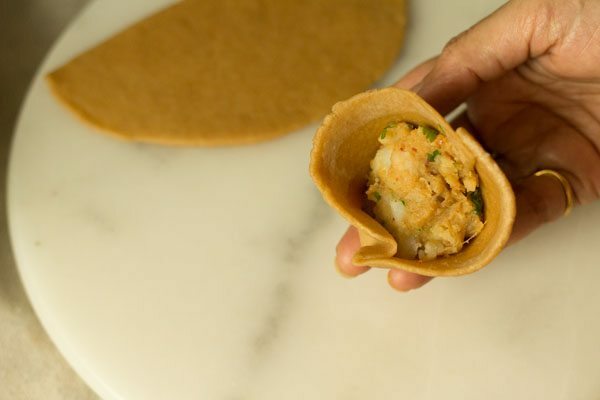 as you go on making them, cover them with a kitchen towel so that the outer pastry does not dry out. before baking, preheat oven at 180 degrees celsius for atleast 15 minutes. now keep them in a baking tray. i baked 6 of them in the oven and 10 of them in the air fryer. 13. brush the samosa with some oil. 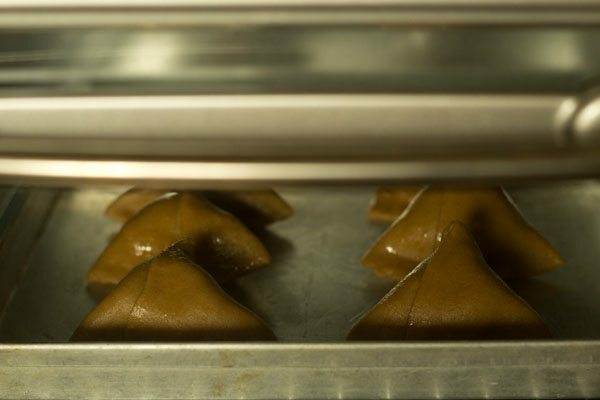 14. bake aloo samosa in a preheated oven at 180 degrees celsius for 30 to 35 minutes. 15. bake the aloo samosa till the crust is golden and crisp. i baked for 34 minutes. 16. allow them to cool down a bit for a couple of minutes as the samosas will be very hot. 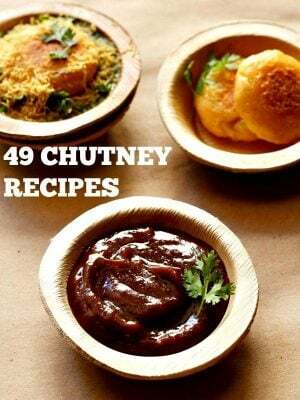 when they are hot enough to eat, then serve these baked samosas with your favorite chutney or with tamarind chutney or coriander chutney or tomato ketchup. 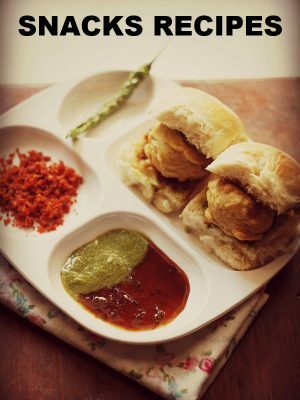 you can also make samosa pav or samosa chaat or samosa sandwich from these samosas. I am planning to buy air fryer can you suggest me which one is good . Subasri, i really don’t know. i got pigeon brand air fryer as a gift and it is working well. but i have not used much. Thanks Lakshmi. I am planning to add some air fryer recipes for a long time. But the requested recipes listed is too long. So can’t commit. Can I use plain flour for this recipe instead of whole wheat flour? Hi I always follow ur recipies just wanna know I have bajaj otg 28littre can you please suggest me in which mode I should keep for baked samosa in bake, grill, toast or roti.? I am really confused when it comes to bake something like this samosa, or baked kachori or baked onion pakoda. Pls solve my query. sujata, i also have bajaj OTG (35 litres). for baking you can either use the toast option (both elements heated) or only the bake option (bottom element heated). usually i use the toast option for samosa or any snack and even cakes, cookies too. i also bake cakes with the bake option. both work fine. just that with bake option, the top takes time in browning or gets less browned. Hi – thanks for the recipe. how do I make this in Philips Airfryer? What should be the temp and for how long should I airfry? Thanks! temp can be 180 degrees celsius. baking time i cannot exactly tell. i baked for about 6 to 7 minutes. I have Philip’s air fryer, how much time would it take in that? it depends on the temperature you use. i kept for around 6 to 7 minutes. but just check once or twice while air frying. 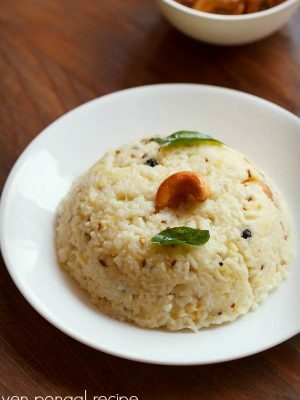 Could this recipe be made with gluten free flours, such as chickpea, quinoa, sorghum, rice or any combination of those. I miss samosas and would like to make a gluten free version. Also, I have tried many of your recipes and love them! Even made homemade dosas! Thanks so much for compiling all these wonderful recipes! Welcome Joan. Thanks for your positive feedback. I have never tried. it can work but some hit and trials are needed to get the right proportions. I m having microwave oven( with convection mode). For above recipie , which mode should be used??? Grill or convection mode??? anuja, convection mode. but do keep a check for the time as in convection mode, the baking is quick. Many times thought to post but each time I felt u r at above of these comments but again it would b injustice not to mention that hw gud u r ….salute to ur efforts… U r the person next to my mom n mil whom I follow n always come out with flying colours… Thanks a tonne ? thanks so much sweta for your kind words and positive views. your appreciation means a lot to us and you are welcome. yes pratibha, you can use, but i would suggest only to use all purpose flour. 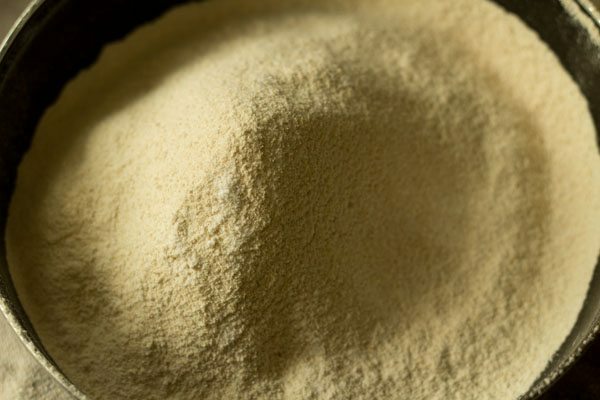 no need to use arrow root flour as arrow root flour is used basically to bind or thicken gravies or soups. very pleased to know this kajol, thanks for positive feedback and kind words. god bless you. Welcome Lakshmi. Glad to know this. Thanks for your appreciation. All recopies are awesome thanks chef..
welcome suvidha and thank you. Which brand of air fryer you are using? can u pls tell me how to keep vegetables fresh in refrigerator? suvidha, i am using pigeon brand. actually it was gifted to us. i keep the veggies in a netted bag or a ziplock bag. greens like palak or methi or amaranth, i pluck the leaves and the keep them in a covered box. then bhindi, capsicum, carrots, beetroots, ginger i keep in ziplock bags. tomatoes – i rinse them and then keep open in the fridge in a tray. onions, garlic and potatoes are always kept out. cauliflower and cabbage, i keep in netted bags. Also baked them in my air fryer just like u mentioned….came out very good?? thankyou ashwini for your positive feedback. can you please post some more recipes using an air fryer? i will add some air fryer recipes. any specific recipe you are looking for? fine shweta. will try to add these. taken a note of them.